Mailigen allows you to add a new subscriber in Mailigen.com account when your chat is finished. Use this opportunity to extend your Mailigen newsletter list and better target your customers! We prepared a short tutorial on how to integrate LiveChat with Mailigen with the use of Zapier. We hope that you will enjoy it! Launch your Zap! – finalize the configuration and start using your new Zap! To make a Zap, log into Zapier and click on Make a Zap available in the upper menu. You will be taken to Choose a Trigger App section. There, type LiveChat into the search field and choose our app. From the Select LiveChat Trigger section, choose Finished Chat. To proceed, click on Save + Continue button available under the list of triggers. Now, click on Connect a New Account and provide your LiveChat Email and API Key. To proceed, click on the Yes, continue button. Click here to get your LiveChat API key. On the next section, click on Save + Continue button. 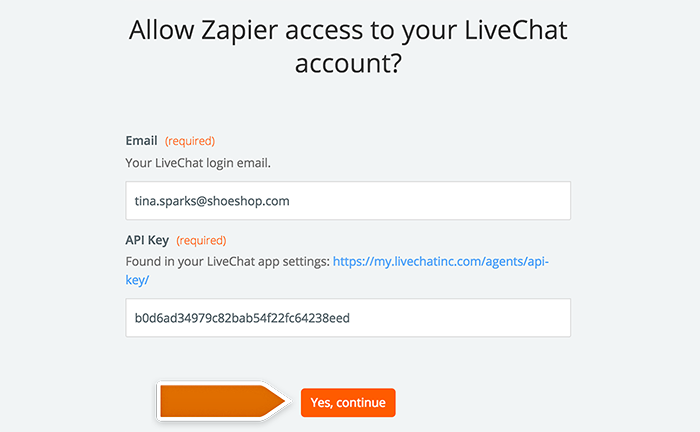 Now it is time to test your LiveChat – Zapier integration. To do that, click on Fetch + Continue. If the test will be successful, all that is left for you is to click on the Continue button. Done! In the next step, we will continue with the Zap configuration. Now it is time to configure the Action that Zapier will make when you finish a chat with your customer. On the Choose an Action App section, type Mailigen into the search field and choose the app from the list. Next, choose Add Contact as the Zap’s action and click on Save + Continue to proceed. Now it is time to add your Mailigen account to Zapier. To do that, click on Connect a New Account button. A new window will pop-up. There, provide your Mailigen’s API key and click on Yes, continue button. On the next section, set up your Mailigen Contact. In the Contact List field, choose a list to which new contacts will be saved. Now, decide if you want to enable the Double opt-in option. Enabling Double opt-in option will allow you to send a confirmation email to your customer. By doing that, he will be added to your newsletter only when he will click on the link in an email. You can also set up option fields, like First and Last name. After setting them up, click on Continue to proceed. On the next section, you will see a summary of a contact that will be created in your Mailigen account. It is also time to test if LiveChat is successfully integrated with Mailigen. To proceed, click on Create & Continue. If everything is fine, you will receive a confirmation that the test was successful. To finalize the configuration, click on Finish button. Done! Now your LiveChat is integrated with Mailigen. All that is left to do is to turn on your new Zap. To launch your Zap, click on the Grey Switch. That will start passing the information from LiveChat to ProjectManager. Also, don’t forget to Name your Zap so that you will be able to find it on your Zapier Dashboard more easily! Done! Now, your Mailigen integration is ready and each time your chat will finish, the new file will be created in your ProjectManager account.